Designed, developed and built in the UK by Force Protection Europe and Ricardo plc, together with Team Ocelot partners Thales, QinetiQ, Formaplex, DSG and Sula, Ocelot is weight for weight, the best protected and most agile vehicle of its kind – capabilities that have been proved by more than 12 months of blast and mobility testing. A clean sheet design, Ocelot has met the MoD’s targets for protection, manoeuvrability, payload, size and gross vehicle weight. It is also extremely flexible, featuring a demountable crew pod that allows multiple configurations for different roles, such as patrol, fire support and protected logistics. While protecting crew within the vehicle has always been the first priority, Ocelot has also been designed from the outset to be easily repaired and maintained in the austere environment of a forward operating base. Its armoured V-shaped hull runs the length of the vehicle and houses the main fuel tank, drive line, batteries and generator as well as the powerpack; this means these vital components are all protected from potential blasts. Not only will this design reduce repair times and costs, because the Ocelot does not include sacrificial elements as part of its protection package, but crucially it also enhances the availability of vehicles for operations in-theatre. 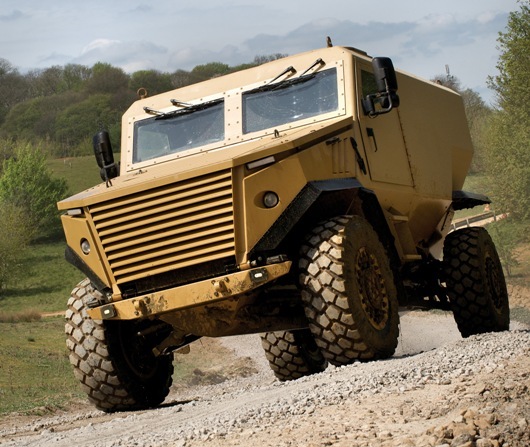 The MoD’s emerging open standards for Generic Vehicle Architecture have been taken into account throughout the vehicle’s development; Ocelot is fully compliant with these and has also been developed to support future integration projects with ease.